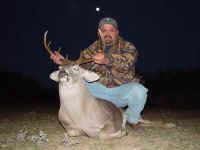 STGS is currently offering trophy whitetail hunts in Frio County. All of our deer are free ranging on over 2,300 acres and offer an excellent opportunity to harvest a trophy class Boone and Crockett buck. Trophy whitetail hunting offers some of the most challenging and exciting hunting available. STGS has instituted a strict game management program including genetic management, year round protein feeding and extensive watering systems. This program ensures proper genetics, nutrition, and water. All of which are necessary to grow true trophy class antlers. Our trophy bucks typically range in the 135"-165" class with management bucks ranging from 120"-135". STGS also offers hunts for cull bucks and does.